High oil prices and slowing world growth weigh on the stock market today. The Dow Jones Industrial Average (DJINDICES:^DJI) had been nearing a record high of 17,000 this week but is down today after numerous events affecting the airline market and world economy in general. As of 1:30 p.m. EDT the Dow was down 100 points to 16,841. The S&P 500 (SNPINDEX:^GSPC) was down 6 points to 1,945. There were a few economic releases today that are pulling the markets, especially the airline market, down. First, the World Bank cut its forecast for 2014 growth from 3.2% to 2.8% as the U.S.' harsh winter and the conflict in Ukraine weighed on global growth. The second economic release was from the Organization of the Petroleum Exporting Countries, more commonly known as OPEC. OPEC announced that it would keep its production target unchanged at the level of 30.0 million barrels per day. OPEC has been producing less than this amount as of late as tensions in Libya curb the country's oil production and exports. 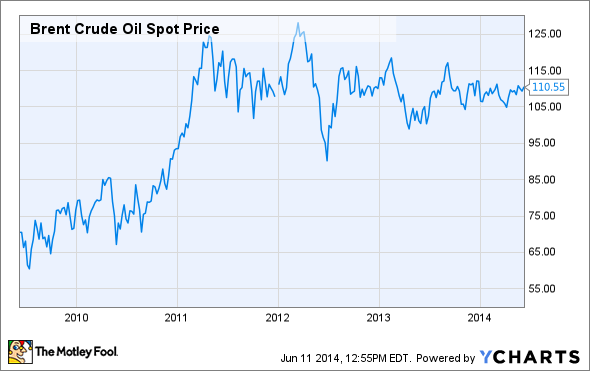 Tensions around the world have been keeping oil prices high so far this year. Many were hoping that OPEC would increase production; OPEC's members are highly dependent on high oil prices so they have an incentive to not overproduce. OPEC's reasons for not raising production show that OPEC is more confident on the economy than the World Bank. OPEC projects that world economic growth will be 3.4% in 2014 and that world oil demand will rise to 91.1 million barrels per day, up from 90 million barrels per day in 2013. OPEC believes that production from non-OPEC countries, including the U.S. and Canada, will grow by 1.4 million barrels per day. While many people tout U.S. shale, deepwater drilling, and Canadian oil sands as a threat to OPEC, in reality that's not the case. These sources are very high cost and in effect they create a floor price for the world's oil markets. If oil prices drop then these sources quickly become mightily unprofitable. As such, OPEC is happy to see high cost oil production take up demand as it keeps prices high around the world. The biggest industry to be hurt by slowing world growth and high oil prices is the airline industry. The airline industry is being weighed on by the two releases as well as a profit warning from German airline Deutsche Lufthansa. Europe's largest airline in terms of passengers, Lufthansa is seen as a bellwether for world airlines. The carrier had expected profits of $2.3 billion to $2.6 billion this year. Today it cut its forecast to $1.76 billion as tougher competition and events around the world including pilot strikes and Venezuela's devaluation cut into its profits. Deutsche Lufthansa's stock dropped 14% in Germany today. On the S&P 500, airlines are leading the stock markets drop with Delta Airlines down 3.24%, and United Continental down 4.3%. On the Dow Jones Industrial Average, Boeing is leading the Dow's drop today down 2.1% to $134.41.